Mark Hanson, Marketing Manager at Ultraframe and chair of the GGF's Conservatory Association, considers the opportunities for cost saving through the use of pre-formed uPVC flashing systems. One brilliant new method of providing an easier, quicker and - in some cases - better finish is that of pre-formed flashing systems - such as Conservaflash from Ultraframe. Pre-formed uPVC flashing can save at least an hour on most conservatory installations, providing a ‘predictable' and consistent engineered solution to the often complex problem of conservatory flashing. It offers a convenient pre-packed solution to the installer, without any of the environmental risks of traditional lead flashing. In addition, because such flashing comes pre-configured with the roof, separate lead cutting, sourcing and waste is obviated, with a typical saving in the range of £50-100 pre installation. It also includes a pre-formed soaker that's pre-clipped into the starter bar and fits behind the flashing. That said, Tim Davies a Director of T&J Conservatories in Manchester reckons even greater time savings are available: "Claims that Conservaflash saves an hour significantly understates the saving - we have used it since its inception in 2003. We find the product to be of great benefit not just as it reduces fitting times but it's easier to work with and there is no risk of oxidising (or contamination of adjacent self cleaning glass through rain water run off) - overall a neater job all round. We use Conservaflash on every conservatory we install, but we will still use lead occasionally if circumstances dictate". T&J Conservatories consists of Tim and his partner John Bostock who have been trading for over 15 years - during that time they have only used the Ultraframe Classic roofing system supplied direct via Prefix Roofing Systems of Accrington. Commented Tim, "I find that Prefix is a first class fabricator and I can honestly say that we have never had any problems in our 15 years .Prefix look after our every need, including supplying the Conservaflash". Three features in particular combine to make Conservaflash from Ultraframe a truly innovative system. Twin weatherbar grooves on the reverse face act as a primary weatherseal and locators for silicone, while on the front face of the stepped flashings, capillary grooves prevent ingress of wind driven moisture. Thanks to a 93-degree angle, each stepped flashing is physically restrained in the mortar chase and ensures integral mechanical retention in tandem with the ‘wedge clips' on the top edge and the wedge ribs on the underside. This means it will always be held firmly in place during back pointing (we strongly recommend grey low modulus neutral cure silicone rather than mortar, which can crack when set). Finally, profiled corners, radiused to the largest angle grinder, eliminate the need to ‘over cut' the mortar joint, saving much time during installation. Whether choosing pre-formed flashing for Victorian or lean-to ‘roof in a box' conservatories, it couldn't be easier to install. Conservaflash is covered by Ultraframe's main BBA certificate too, giving extra peace of mind that the system is ‘authorised'. 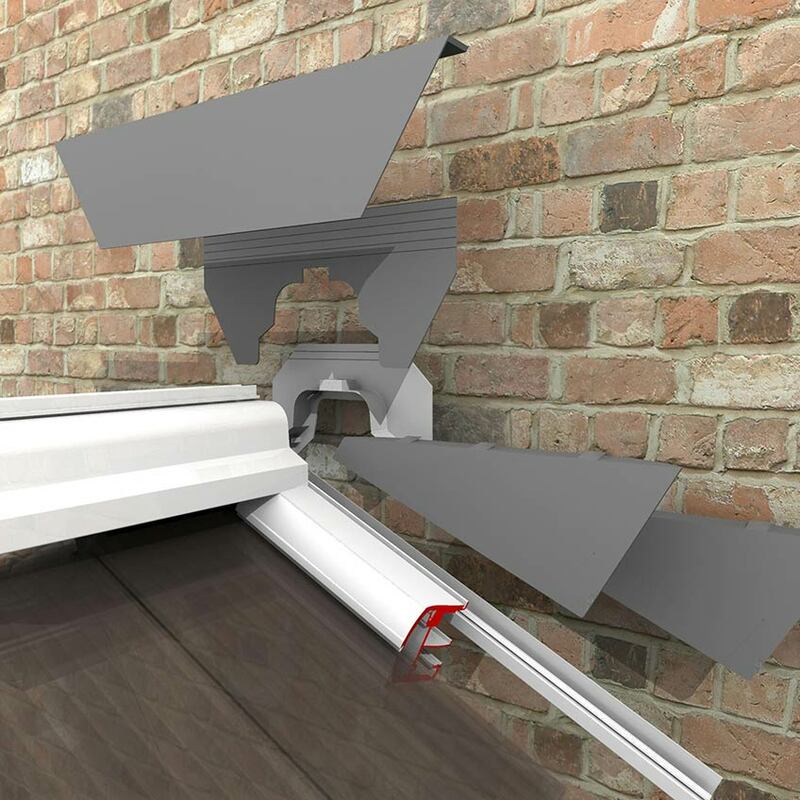 Installation could not be simpler - simply chase out the host wall with a grinding wheel, install the Conservaflash stepped units from the gutter end towards the ridge, install the pre-formed apron flashing and then the horizontal strip flashing before siliconing the joint for a perfect finish. Step by Step installation guidelines for Conservaflash are contained in our highly comprehensive Classic and Classic Plus guides which are sent out with every roof. Whether a retail installer buys direct or through one of the many routes to market that Ultraframe's products are available through ( specialist roof fabricator, complete conservatory supplier, trade counter service) doesn't matter, as Conservaflash is configured at point of ordering thereby ensuring the product turns up with the roof and no separate sourcing is needed. Conservaflash is a business boosting flash of inspiration from Ultraframe. Ask for it on your next conservatory project.